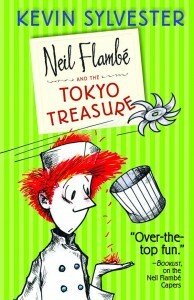 Neil Flambé and the Tokyo Treasure~Revealed! Welcome to a new feature of 32 Pages-the Art Reveal, where an about-to-be-published book is introduced in all its awesomeness. 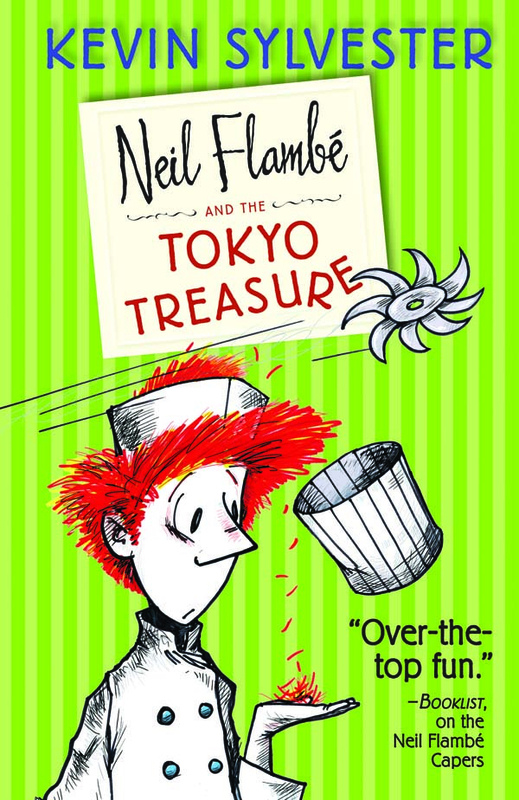 Kicking off this new feature is Neil Flambé and the Tokyo Treasure, book 4 in a series of culinary mysteries by Kevin Sylvester, starring Neil Flambé~a 14 year old ‘wunderchef’ not unlike Gordon Ramsey-if Gordon Ramsey was a ginger with a talent for solving crimes. Like Mr Ramsey, Neil can cook anything, and he can do it better than anyone else. Maybe he’s a bit cocky, but patrons pay top dollar and wait months for reservations at his tiny, boutique restaurant. Child labour laws aside, what those around him don’t know is that his talents do not stop at crème brûlée. With an extraordinary sense of smell, and the help of police inspector Sean Nakamura, this budding young detective is as good at cracking crimes as he is at cracking eggs. One does not usually think of carrots in the same breath as ‘scary’ or ‘unsettling’, unless they are cooked English-style, which is to say, boiled until they are mush. Tasty, yes, but boring. Bereft of personality, you would think, but…you’d be wrong. In Aaron Reynolds and Peter Brown’s new book Creepy Carrots, we are introduced to the other side of this most unassuming of vegetables, the side that is capable of all sorts of mayhem. Tread carefully in your garden, folks. The carrots are watching. I did not intend to write another post about a bugs, but UnBEElievables found me a few days after I purchased The Beetle Book, and well, bees are irresistible. Like beetles (and all bugs), I was scared of these tiny, furry creatures for most of my life, or at least until I started observing and learning about them. However, as in all things, the more you know, the less fear it engenders (tarantulas excepted.) And there is a lot to know about bees~a lot we should know, and a lot that is just fun to know. In UnBEElievables, Douglas Florian gives us both, along with some truly fetching bee art. In 14 lively poems, Florian introduces us to the intricate and highly structured life of the honeybee. 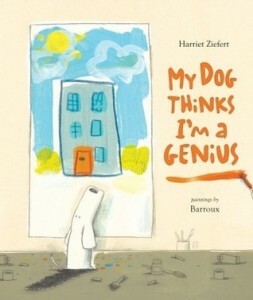 Each poem is accompanied by factual blurbs and the most charming paintings of insects this side of a grade two class. This is not a criticism. The multi-media illustrations are full of smiling bees, and it’s impossible not to respond in kind while flipping the pages of this book. Even the super cool, sideways cap-wearing bees of Drone (“Brother! Yo, Brother! Bee-have in your hive!…”) are sporting grins. This is a good thing, as it’s important to see apis mellifera as affable, hard-working, and life-enriching contributors to our world. Indeed, viewed through Florian’s nimble and mischievous imagination, UnBEElievables will make you want to run out and beefriend a bee. Just don’t look for the hats. I’m pretty sure he made that up.